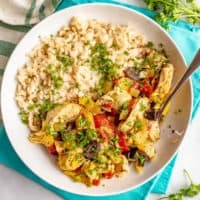 Slow cooker Mediterranean chicken is quick and easy to prep and bursting with bright, healthy flavors. 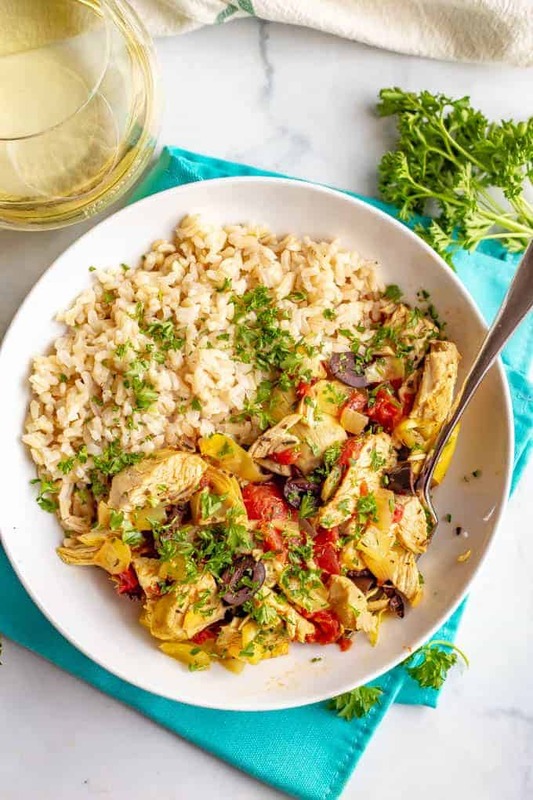 This meal is loaded with tomatoes, artichokes and olives and goes great with rice or couscous. 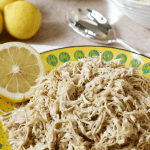 I’ve got a great recipe for you today, originally made for me by my mother-in-law when we were visiting them in Florida. We always have so much we want to do and see while we’re there that a hands-off, low-key meal is a must. And that’s exactly why I love crock pot meals — they are super hands off. 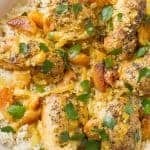 My slow cooker apricot chicken and slow cooker balsamic chicken are regular go-tos all year long. 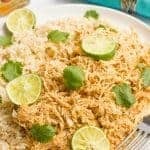 And I make my slow cooker Mexican shredded chicken all the time to use for rice bowls, tacos, nachos and more. I especially love slow cooker recipes like today’s that are super hands off. Just add all of your ingredients, turn it on and get on with your day! Dinner is waiting for you later, which is a glorious thing. 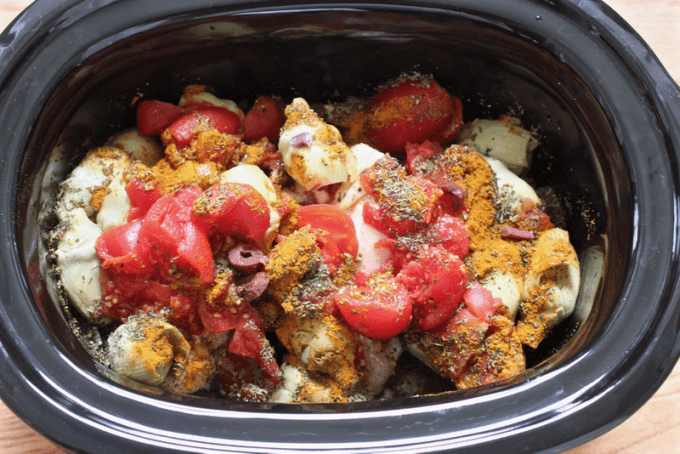 And this slow cooker Mediterranean chicken is a complex medley of flavors. 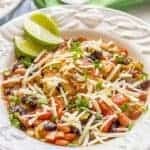 No boring, bland crock pot cooking here! 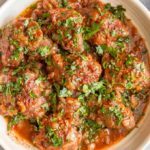 But despite having some heavy-hitting ingredients — tomatoes, olives, curry powder — everyone places nice together and it all melds into a delicious mix. It must be all that time spent together cooking away. Gotta love a long simmer that develops ALL the flavor and yet is so hands-off! You will catch a whiff of olives in the air while this is cooking. Not overpowering, just enough of a hint to whisk you away to a field of olive trees in Italy. It’s divine. Go with it. I use canned whole tomatoes for this recipe. I drain them and then just use a knife to cut them up in the can a bit so they aren’t so huge. They break down further while cooking. You could sub diced tomatoes as well, just be sure to drain them well. Once it’s cooked, you can either slice or shred your chicken for this recipe. Then you’ll mix it back in with the other ingredients so it can soak up some of those lovely juices. 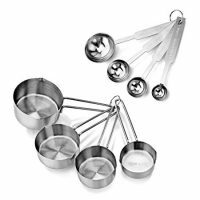 I recommend that you use a slotted spoon to serve it from the crock pot so you can more carefully control how much of the liquid you get. You don’t want it too dry, but you also don’t want soup. Finally, a sprinkling of fresh parsley (or cilantro) helps add some freshness and brightness to the finished dish. You could use a squeeze of lemon in a pinch if you prefer. Just helps wake up the flavors after they have been slow cooking for so long. As is, this is low-carb and gluten free. You can keep it that way by serving it with cauliflower rice or spaghetti squash. 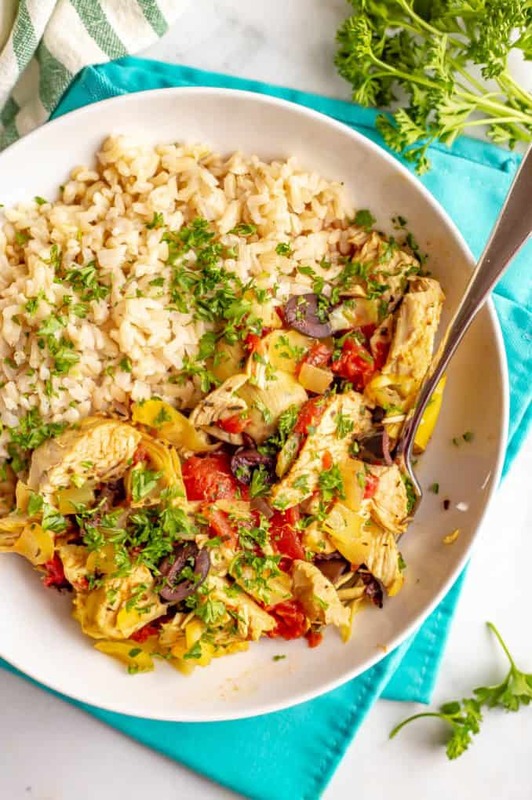 We also love serving this Mediterranean chicken over steamed brown rice, and you could also use couscous, quinoa or even polenta. Or serve it with a hunk of crusty bread. Beyond the fresh herbs, you can also sprinkle the finished dish with some crumbled feta cheese. Pine nuts or slivered almonds would add a fun crunch if you have those on hand. Whatever you do, take this journey to the Mediterranean for your next weeknight dinner. It’s as easy as it gets and you can’t beat the flavor! P.S. 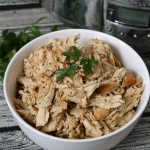 Check out my other slow cooker chicken recipes for more easy dinner ideas! Slow cooker Mediterranean chicken is quick and easy to prep and bursting with bright, healthy flavors. Place chicken breasts in the insert of the slow cooker. Combine the curry powder, basil, thyme, salt and pepper and stir well. Season the chicken with half of the seasoning mixture. Add the remaining ingredients to the slow cooker (except for the fresh parsley) and sprinkle in the remaining seasoning mixture. Once finished, remove the chicken breasts and either chop them or use two forks to shred the chicken. Stir the chicken back into the slow cooker mixture to help soak up the juices and flavors for 5-10 minutes. Then you can serve or let it hang out on warm for up to 30 minutes. Sprinkle with fresh parsley and serve over couscous, brown rice, quinoa or whole wheat pasta. If you are a real olive lover, add an extra 1/4 cup of chopped olives to the crock pot. Or, reserve them as a garnish to really get their full flavor. This freezes great, so you can pack up the extras, once cooled, and store them away for a rainy day. This sounds and looks amazing! I love kalamata olives and artichoke hearts!! Kathryn, this looks fabulous! 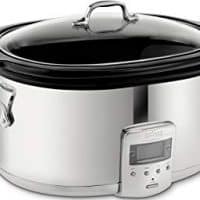 I am so busy and always in need of a great recipe that I can throw in the crock pot, leave, and come back home to a delicious cooked meal. I am so excited to try this for my family! 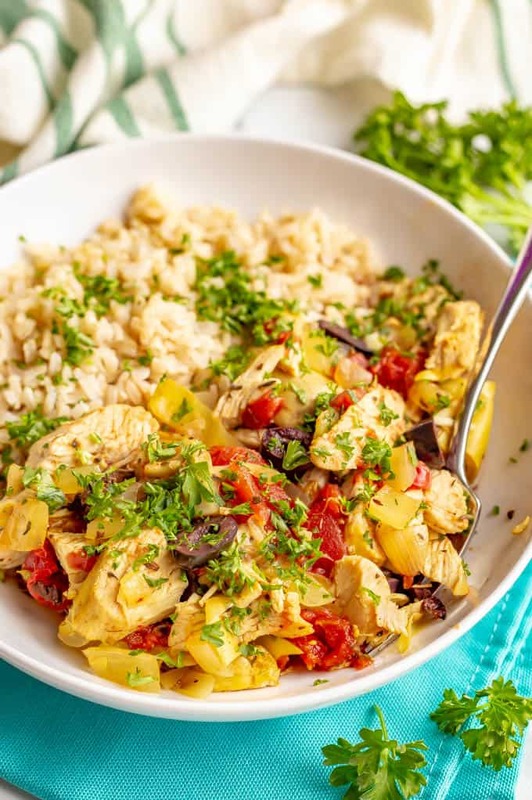 This mediterranean chicken looks seriously SO flavoursome and delicious. Perfect excuse for me to pull out and use my crock pot! Thanks Thalia! So many good flavors here. Definitely worth hauling out the crock pot and letting it do all the work for you. Hope you try it and let me know how you like it! Hi! Any reason you feel I couldn’t freeze it uncooked for later use? I usually prep and freeze on the weekends when I have a little time. Thanks in advance for your thoughts! Sure, you certainly could get it all prepped and bagged up and keep it in the freezer for when you’re ready to make this. 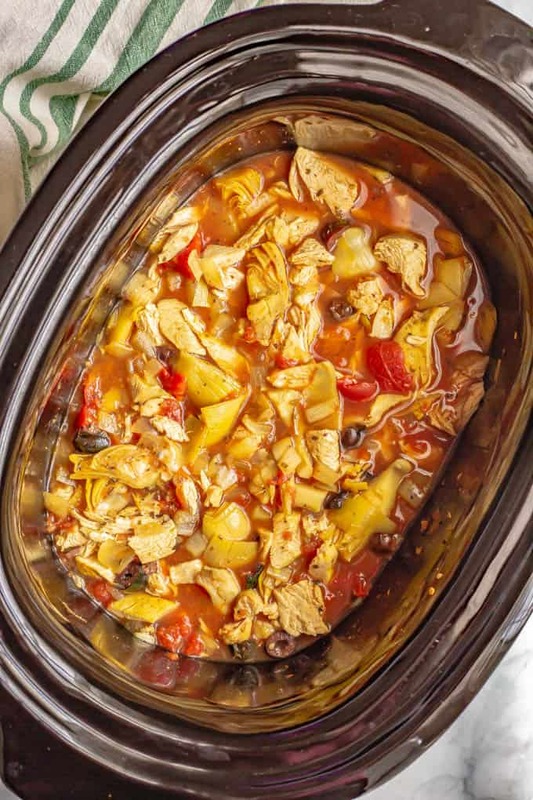 Though honestly, this recipe just takes 5 minutes to throw all of the ingredients in the slow cooker, so you might be making more work for yourself by bagging it up and freezing it. Either way, I hope you enjoy it!! Hi Liz! I think the lemon and spinach sound like great additions – hope you both enjoyed it and had a lovely Valentine’s Day! Thanks! The curry powder really brings a lot of flavor and helps tie everything together! I made this tonight, served it over orzo, and it was an absolute hit! I wouldn’t change a thing from the original recipe. I’m so happy to hear that Jody! Thanks so much for sharing! They give it such big flavor! Can I use something else in place of white wine vinegar? Great recipe! I have made several versions of this – but this is the first with the curry powder. Wonderful flavors! I’m so happy to hear you enjoyed it Vivian! It’s a favorite recipe in our family! I am doing this method in a cast iron pot via Braising. I hope it works out. Looks great! I hope you enjoy it! And would love to hear if it turns out that way – let us know! 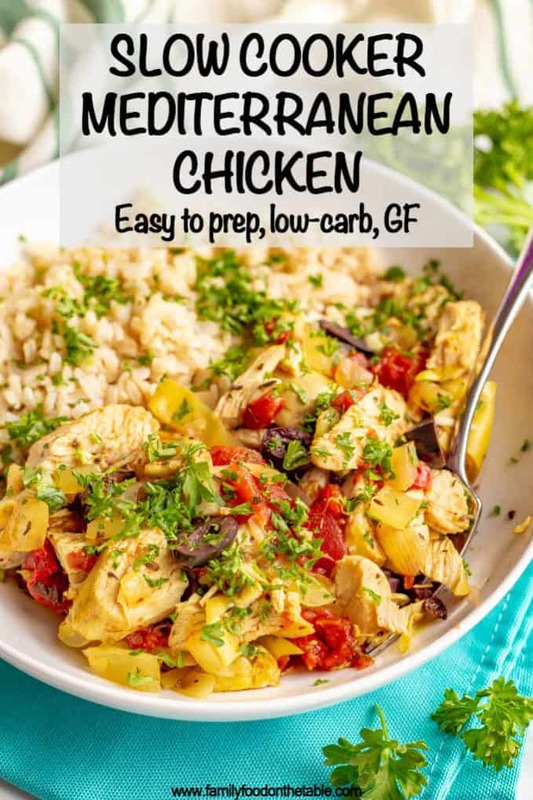 Hello,I check your blog named “Crock pot Mediterranean chicken – Family Food on the Table” like every week.Your writing style is awesome, keep it up! And you can look our website about proxy server list. It reminds me of pasta puttanesca, but with chicken. I am going to take it for lunch and stuff it into pita pockets. Or maybe less chicken broth? Hi Erin! You can do the full recipe and just save any leftovers (it freezes great!) or you can reduce the ingredients a bit and just use 1 cup of chicken broth. Hope that helps! This would be a perfect meal for me any night of the week! It’s so easy and so yummy! I hope you try it! This looks so flavorful and delicious! I going to make a big pot of this for meal prep for the week and maybe freeze some for later since it freezes well. We’re olive fans for sure so I’ll definitely be adding the extra ones – yum! I own a campground and stay there on the weekends from April-October, so I’m always looking for easy crock-pot meals or casseroles. I made this last night – I used chicken thighs instead of breast and it ended up cooking on low for 8 hours. It was great. So easy, great flavor, something different! Going into regular rotation and I’ll be trying your other crock-pot recipes. I’m glad I found the site (Simply Recipes Facebook post got me here). Thanks for a great recipe!